If you’ve been hunting around for a used vehicle, you’ve probably assumed that you’ll have to ultimately opt for an older, beater vehicle. However, that isn’t necessarily the case. Customers will still have an opportunity to opt for a luxurious sports car like a used Porsche Cayman/Boxster. The Porsche Boxster and Porsche Cayman are remarkably similar, which probably explains why the brand continues to market the nameplates as a pair. The similarities include the engine and the seating for two. Ultimately, the major difference comes down to the body type; the Boxster is the convertible version of the vehicle, while the Cayman is a coupe. Sure, these vehicles are relatively expensive when you opt for new versions. However, you’ll see some significant savings if you end up opting for a used variation of this nameplate. Best of all, it doesn’t matter what model year you come across, as each yearly variation of the nameplate has proven to be remarkable. The third-generation of the beloved Boxster first made its debut at the Geneva Motor Show, with the vehicle hitting dealership lots later that year. Known internally as the Porsche 981, the vehicle provided customers with more style and improved performance, all leading to an unmatched owning experience. Engineers used the Porsche 911 and 918 as inspiration for their revised convertible, especially when it came to the exterior aesthetics. While the vehicle was as smooth and sleek as ever, there were some notable changes to the mechanical aspects of the nameplate. Specifically, the brand revised the vehicle’s chassis, and they made the wheelbase a bit wider. This didn’t only lead to some cosmetic changes; rather, these revisions also helped to optimize the vehicle’s control and drivability. The brand even managed to make the vehicle slightly lighter than previous variations, which has a vicarious impact on fuel efficiency and performance. Speaking of, the vehicle could be equipped with a pair of brand-new engine offerings: the 2.7-liter flat-6 engine and the 3.4-liter engine. The former option was capable of delivering up to 261 horsepower and 207 pound-feet of torque, all leading to a 5.5-second zero-to-60 mile per hour time and a top speed of 163 miles per hour (on the PDK Sport Chrono transmission version). Meanwhile, the 3.4-liter engine managed to take those power specs to a whole new level, promising drivers up to 311 horsepower and 266 pound-feet of torque. These improved specs had a predictable impact on performance; drivers could capitalize on an incredible 4.8-second zero-to-60 mile per hour time and a top speed of 172 miles per hour (on the PDK Sport Chrono transmission version). That PDK transmission included seven speeds, although drivers could also opt for a six-speed manual transmission. Engineers also added a number of additional mechanical amenities that helped to improve the overall performance of the vehicle, including Porsche Torque Vectoring. With so many changes coming to the nameplate for the 2012 model year, the brand didn’t do a whole lot to improve the Porsche Boxster for the 2013 model year (not that we blame them). The majority of the changes were cosmetic. The brand added brand-new LED taillights, an inclusion that doesn’t only boost the style of the vehicle but also alerts other drivers of your presence. Air-intake valves were added to the front and side of the vehicle, while the new rear end helped to better accommodate the convertible top. Ultimately, if you’re impressed by everything that the 2012 model has to offer, you should feel the same about the 2013 variation. This is only a positive for you; by being open to multiple model years, there’s a better chance you’ll be able to find a used Porsche Boxster for sale that fits your specific needs. For starters, the Boxster again remained mostly the same for the 2014 model year. In fact, the only notable change came to the interior, as the brand added the incredible Burmester audio system. Thanks to this inclusion, drivers could now anticipate an unmatched listening experience as they’re cruising down the road in their new convertible. Most notably, the brand unveiled the third-generation of their beloved Cayman in time for the 2014 model year. The vehicle initially debuted at the 2012 Geneva Motor Show, and it hit dealership lots soon thereafter. Besides the different body structure, the vehicle was relatively similar to its Boxster counterpart. The vehicle could be equipped with either the 2.7-liter engine or the hulking 3.4-liter engine, and drivers could also choose between the six-speed manual transmission or the intuitive seven-speed PDK transmission. Pundits were particularly fond of the vehicle’s incredible driving ability, as the Cayman ultimately deliver a unique, one-of-a-kind driving experience. When it comes to differences between the second-generation of the Cayman, customers will notice major changes to the body, including a revised wheelbase and a new front track. The interior was also slightly improved, providing customers with a more luxurious driving experience. The Porsche Boxster and Porsche Cayman saw few changes in time for the 2015 model year, but that isn’t a bad thing. The brand continued to produce a pair of the premier sports luxury vehicles, and the nameplates continued to be among the most popular offerings in the class. Specifically, the Cayman saw the addition of GT4 trim, which added a bit of athleticism to the exterior and interior of the coupe. Meanwhile, the Porsche Boxster was available as a GTS model, providing customers with the much-desired Italian luxury. Specifically, drivers will enjoy the boosted performance and opulence of their brand-new convertible, allowing customers to truly test the limits of their Porsche. Some major “changes” came to the Porsche Boxster, including the introduction of the beloved Spyder variation of the nameplate. This version of the convertible was really for Porsche enthusiasts, as the vehicle included amenities that would only truly be appreciated by hard-core fans of the brand. For instance, the manually-operated top and manual gearbox probably wouldn’t appeal to typical drivers, but these features were beloved by fans of the Boxster. The Spyder also helped to improve some mechanical aspects of the ride. The 375-horsepower 3.8-liter six-cylinder engine allowed drivers to realize a 4.3-second zero-to-60 time, while the improved sport suspension will allow drivers to remain in control of their vehicle despite all of that speed. 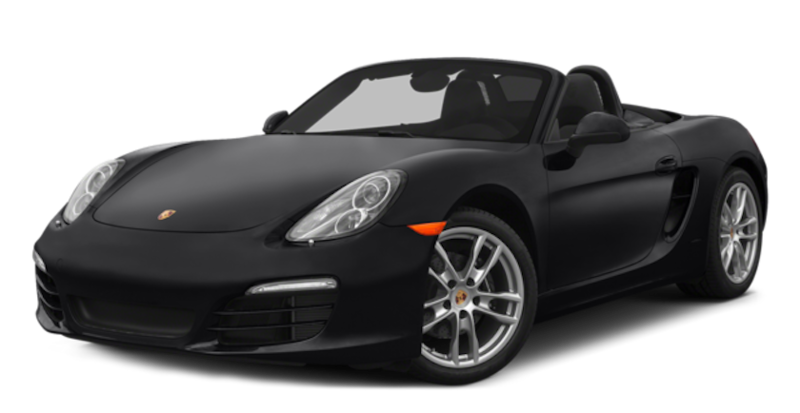 Otherwise, customers had the opportunity to opt for the Black Edition Porsche Boxster, which included a number of striking, all-black amenities. If you were searching for an intimidating, sport convertible, this was surely the perfect option. The third-generation Porsche Cayman didn’t see a whole lot of changes after only a handful of years on the road. For the 2016 model year, Customers had the opportunity to opt for the GT4 model, which included the same performance specs as the 911 Carrera S. Otherwise, the beloved coupe mostly remained the same, meaning that if you can find a used Porsche Cayman for sale it will certainly be worth your while. Now that you’ve established that a used Porsche Cayman/Boxster is the logical choice, it’s time to start shopping. Well, if you live in the Cincinnati, Ohio area, there’s no better place to make that purchase than McCluskey Auto! The dealership’s vast inventory means you’ll be able to find a vehicle that fits your specific wants and needs, and the competitive pricing means you won’t suffer from any FOMO (fear of missing out… on a better deal). Furthermore, the flexible hours and easy-to-find location mean you won’t be wasting any of your precious time. Rather, you can devote all of your efforts to completing your inevitable purchase! Plus, the dealership’s array of services will prove to come in handy before and after you’ve made your purchase. The finance department can help out those who are seeking some financing on their impending purchase, even if you’re struggling with your credit. Meanwhile, the service department can quickly fix up any issues you’ll come across with your used Porsche Cayman/Boxster, assuring that you’re back on the road as soon as possible. So what are you waiting for? If there’s a used Porsche Cayman/Boxster sitting on a dealership’s lot, there’s a good chance that the vehicle won’t last forever. That’s why you should head out to McCluskey Automotive today to get your hands on this incredible used luxury ride!